My not-so-profound thoughts about valuation, corporate finance and the news of the day! HP's Break Up : Value Enhancement, Pricing Game or Management Hype? In my post on corporate breakups, I looked at the value and price consequences of breakups. Since that post was triggered by the news stories about HP and eBay splitting themselves, I though it would make sense to put those companies under the microscope, to see if they are good, neutral or bad candidates for the breakup story. In this post, I will focus on Hewlett Packard, a company with a long and rich history as a technology company, that has been a case study on bad corporate governance, the dangers of overpaying for acquisitions and the perils of bad accounting for the last few years. HP: From a bad past to a better future? 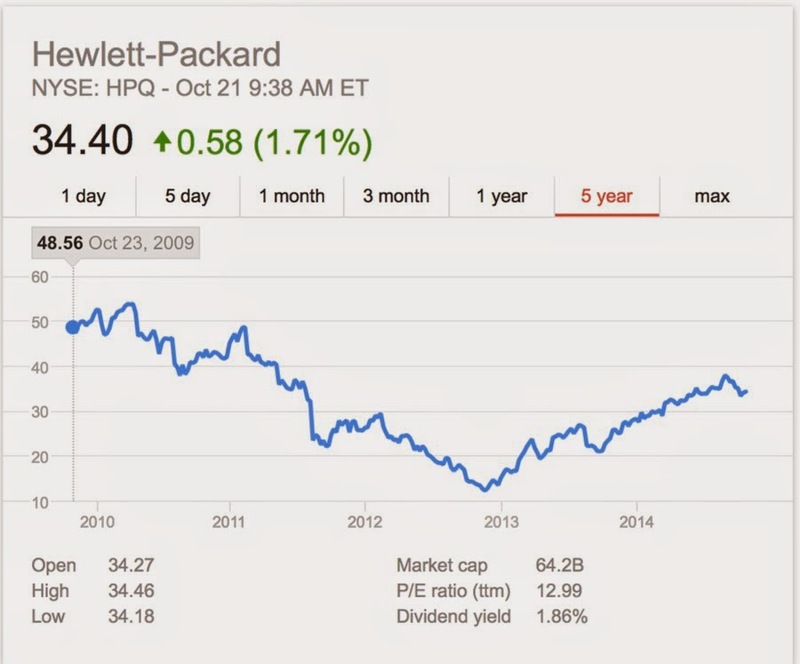 The last decade has not been a good one for Hewlett Packard. During the period, the company has not only seen its core businesses (computers, printers, business services) come under assault but it has also had self-inflicted wounds from corporate governance failures and terrible acquisitions. I posted on one of those failed acquisitions (Autonomy) a while back and you can read the post here. You can get HP’s latest annual report, 10K and 10Q, as well as a summary of the company’s financials over time. Note that the combined operating income for the two businesses in the last twelve months ($11.4 billion) exceeds the operating income for HP as a consolidated company ($8.6 billion) by about $2.8 billion. The footnote suggests that this does not include corporate investments (I assume that this refers to unallocated corporate costs) and seems to leave the impression, intended or not, that these costs will disappear after the break up. You can check for yourself, by downloading the spreadsheet that I used and tweaking or changing the numbers that you think I got wrong. Bad management: It is entirely possible that the existing management at HP was aware of its bloated cost structure and chose to do nothing (or very little) about it. The problem with this rationale is that the broken up units will be run by the same management (Meg Whitman and Dion Weisler) that run the consolidated company. Regulatory considerations or other restrictions: As far as I can tell, there are no obvious restrictions on HP laying off employees or cutting costs. The only peripheral concern may be that HP has its corporate base in California, a state with more stringent restrictions on corporate actions than most others in the US. For this story to have any play, though, one or both of HP's units would have had to move its corporate base elsewhere. Financial leverage and taxes: While debt always seems like a gimme when it comes to value enhancement, the debt ratio of 19% that is borne by the consolidated HP is greater than the debt ratios of the two sectors that its units will inhabit. Hence, if there is significant borrowing capacity that will be unleashed by this break up, I don' see it. It is also possible that this break up is a cover for a tax inversion, where one or both of HP's units will move overseas, but I seriously doubt it. In summary, even if HP is right about the potential for cost cuts in the company, the break up seems to be an elaborate and unnecessary mechanism to make it happen. Market mistakes: It is possible that the market is under valuing HP but it is difficult to argue that this is because the market is significantly misplacing in one of the pieces. The reality is that neither part of HP (business services or computers/printers) has been doing well and that the market is building in the expectation of continuing revenue decline and margin compression. Contaminated parts: Neither part of HP carries toxic attachments that may drag the company down. In fact, the most toxic parts of HP are the acquisitions that it has done in the last five years and breaking up into two businesses is not going to stop that predilection. Simplicity story: Is HP much simpler to value as two businesses than as one? I don’t think so. The businesses are not vastly different in their risks and cost structures and on the face of it, there is little to be gained from having two independent units that you could not have gleaned from the consolidated enterprise. Do I believe that HP's price will triple if they break up? 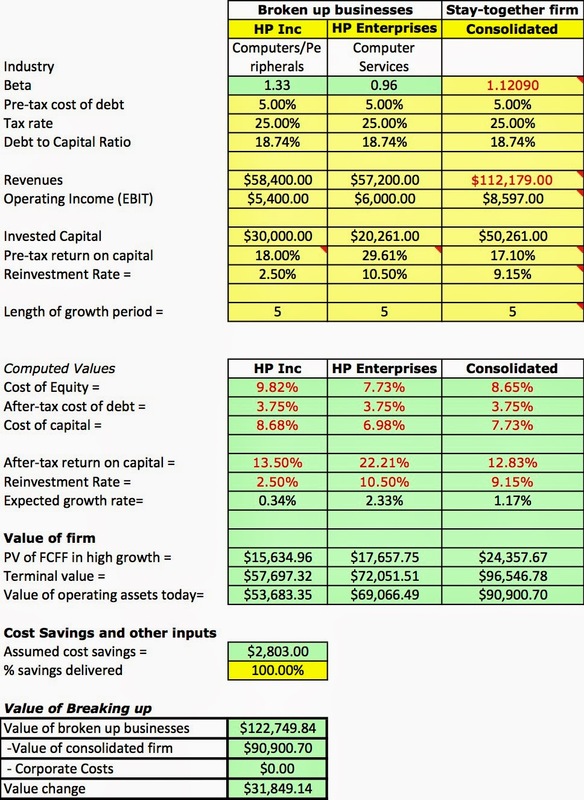 Not for a moment, but I would not blame HP's management for trying to play this game, where they hold forth the most desirable operating metric for each unit (revenues, EBITDA, EBIT) and push analysts towards the sector that delivers the highest multiple of that operating metric. I don't think it will work because HP is being priced as a no-growth, declining-margin company now and breaking it up into two no-growth, declining-margin companies does not change the calculus. Your assessment of this break up boils down almost entirely to whether you think that there will be cost savings from the break up and how big and lasting those savings will be. I am skeptical. I think that the company is over estimating its capacity to cut costs, finesse capital structure and grow in the future and I am afraid that it is carrying bad (value destructive) habits with it into the new ventures. I am also unclear about why there has to be a breakup of the company for their cost savings to manifest themselves. I don't see a significant potential for a pricing correction from the break up, either, since there are no radical differences between the two units and very little clarity added by the break up. "If you build it (revenues), they (profits) will come": Amazon's Field of Dreams! I have a long standing fascination with Amazon from its inception as a dot-com poster child in the late 1990s to its current standing as online retailer to the world. I have always liked the company's willingness to challenge established rules on how business should be done and admired Jeff Bezos for being to willing to leap into places where others only tip toe. As an investor, though, I have found the company to be cheap at times in the last 15 years and expensive at others, and the most recent earnings report led me to revisit it, partly to examine whether the market's negative reaction to the most recent earnings report was appropriate and partly because I may learn something. It is never flattering to the ego to compare actual to forecasted numbers, especially for young growth companies but it is a process that has never bothered me, because it comes with the territory. I compare my forecasted revenues & operating income for Amazon (from my January 2000 valuation) to the actual revenues & operating income for the company (from 2000 to 2013) in the table below. I will cheerfully confess that I did not have the foresight to predict the behemoth that Amazon would become in retailing and the tentacles that it put into other businesses (including media and cloud data) but my forecasted revenues were higher than the actual numbers every year through 2010. Since 2010, though, the company has blown the lid of my revenue forecasts but that outperformance has come at a price. I may have been pessimistic in my assessments of Amazon's capacity to scale up its revenues, but I was also overly optimistic in assuming that it would find a pathway to strong profitability. After mounting a steady improvement in margins in the first half of the last decade, the company seems to have relapsed in the last few years. A couple of years ago, James Stewart wrote an article in the New York Times, using Amazon to draw a contrast between short-term markets and long-term managers. The discussion about whether markets are short term and if so, why, is one well worth having, but I took issue with Mr. Stewart on his use of Amazon as an example of short term markets. In fact, I would argue that markets have been extraordinarily forgiving of Amazon's long loss-making history and have given Mr. Bezos breaks that very few companies have received through time. If anything, they have been too "long term" in their thinking, not too "short term". In keeping with my obsession with popular culture, the movie that comes to mind whenever Amazon reports yet another earnings report, with strong revenue growth and decreasing profits, is the Field of Dreams, with this scene, in particular, playing out. As I see it, Jeff Bezos has built the ultimate field of dreams company (and I don't mean that in a dismissive way), where he has sold investors on the notion that if he builds revenues up, the profits will come. The losses at Amazon are thus a deliberate consequence of the way the company approaches business, selling products and services below cost and with lots of hype, with the intent of inserting itself in peoples' lives so completely that they will be unable to abandon it in the future. To provide a simple illustration of this process, consider one of Amazon's most successful services, Amazon Prime, to which I am a subscriber. At $99/year, it is a bargain, since the shipping costs I save vastly exceed the cost of the service. While that may reflect my family's profligate spending habits, there is some evidence in Amazon's own financials that the cost of providing this service significantly exceeds the revenues that they collect from it. 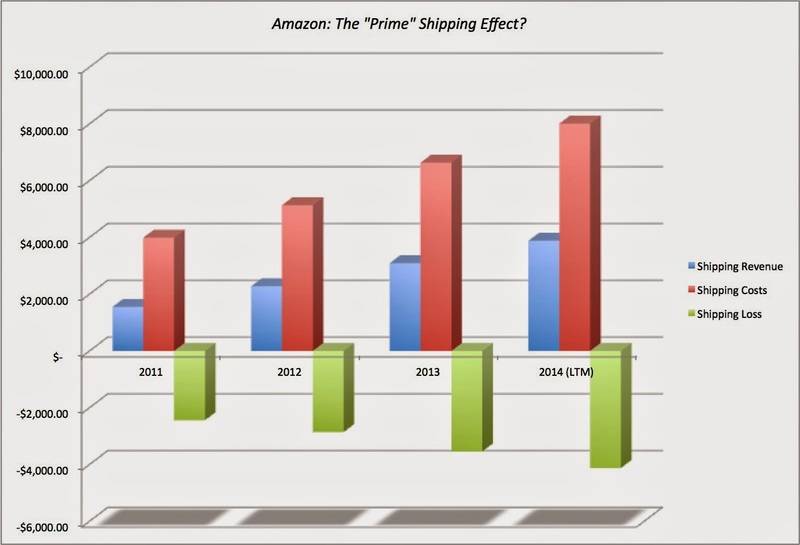 In the figure below, I compare shipping revenues and costs reported by Amazon each year for the last few years. Not only has Amazon lost billions on shipping each year, but its losses have become larger over time. In fact, you can take many of Amazon's recent innovations (including the Kindle) and put them to the profitability test and will find them falling short. I am sure that Amazon's cheerleaders will argue that both the Prime and Kindle create synergistic benefits to Amazon, but that argument would have more resonance, if the company made money in the aggregate. Note that while Amazon makes the top ten lists in terms of revenues both in the US and globally, it lags in terms of profitability with paper-thin operating margins. To get a measure of profitability in the retail sector, I estimated operating margins (converting leases to debt) for all retail firms and report the distribution in the graph below (for both the conventional pre-tax operating margin, which is operating income as a percent of sales, and a lease-adjusted operating income, where leases are converted to debt). Since many of the firms in this sample are small, with revenues of a billion or less, I looked at the pre-tax operating margin for firms in different revenue classes and the results are not surprising, with margins decreasing as revenues increase. 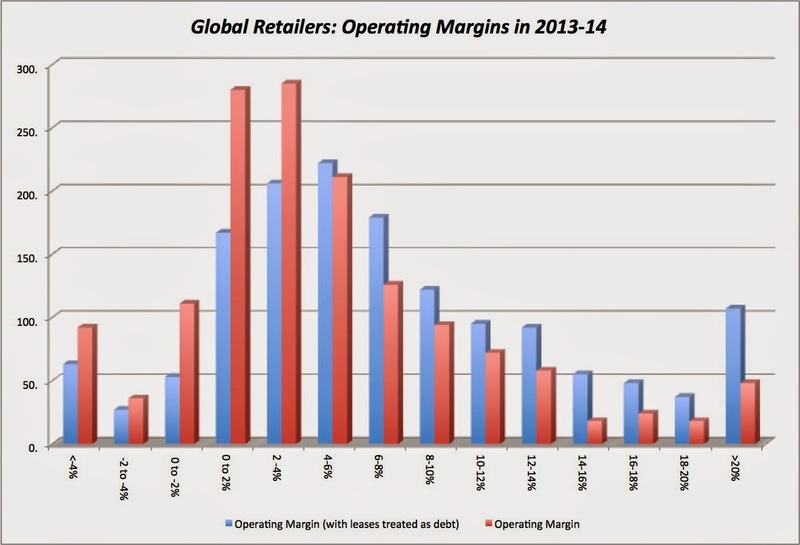 The median pre-tax operating margin for a US retailer with at least $1 billion in sales is 7.67% and the 75th percentile is 11.99%, but the median operating margin for US retailers with more than $10 billion in sales drops to 5.14% and the 75th percentile is 10.17% (and the 25th percentile is only 2.85%). It is true that Amazon also draws revenues from its media and cloud computing businesses and that the margins are higher at least in the media business. Using a (revenue) weighted average of the operating margins across the businesses (with the weights based on Amazon's mix of media and retail) yields values of 4.35%, 7.38% and 12.84% for the 25th percentile, median and the 75th percentile. If you assume that Amazon will continue its steep revenue growth into the future (and is able to grow revenues to about $250 billion by 2024) and that its operating margin will converge on the weighted median operating margin for the retail and media sectors (7.38%), the value of equity that you obtain is about $81 billion (or $175/share). You can download the spreadsheet that contains the Amazon valuation. If you are bullish on Amazon, at its current stock price, you have to be either be expecting even higher revenues (than $250 billion) in 2024 than or much higher steady state margins (than 7.38%), with the best-case scenario being one where Amazon continues growing revenues significantly, driving its competitors into bankruptcy, and then uses its market power to charge higher prices and generate high profit margins. Thus, assuming a 12.84% operating margin (the weighted average of the 75th percentiles), in conjunction with the revenues forecast in the base case, would yield a value per share of $345/share, higher than the current stock price of $295. I draw three lessons from this table. The first is that there are pathways that Amazon can follow that deliver values greater than $292 but they are narrow and require a combination of high revenue growth and high operating margins, and some of these combinations may expose the company to anti-trust action down the road. The second is that the variable that makes the bigger difference is the operating margin, not revenue growth. In fact, if the margin stays at 2.5%, higher revenue growth causes value to decline as the cost of increasing revenues (acquisitions and reinvestment) exceed the benefits. The breakeven operating margin at which growth even starts to create value is about 4%. and if the operating margin stays at 7.5% or lower, you cannot get above the current stock price, even with Walmart-like revenues. The third is that the potential for explosive returns is low, given the current stock price. While there are combinations of revenue/margin that deliver values well above $295, they seem improbable, requiring Amazon to have revenues like Walmart and margins like Lululemon. In a world of cookie-cutter CEOs, uninspired and uninspiring, eager to please analysts (rather than investors) and playing the me-too game (You can buy back stock, me too! You can do acquisitions, me-too! ), Jeff Bezos offers a refreshing contrast. He has a vision for Amazon, has communicated it to markets with passion and has acted consistently with that vision, and has been rewarded by markets with a high market value for his company, even in the absence of profitability. However, the peril with charismatic CEOs is that the strength and single-mindedness that make them so successful can become weaknesses, if they start believing the hype. As a consumer, I am delighted that I get Amazon Prime for $99 a year, that the Kindle costs a lot less than an iPad and that I can (though I don’t plan to) pick up the Amazon Fire for nothing, but as an investor, this is not a winning game. Mr. Bezos has delivered on half of his field of dreams vision by building up the revenues for Amazon, but the other (and more difficult) half of the vision requires that the “profits” arrive. Much as I would like to believe in miracles, it will take far more work to make Amazon profitable than it will to make Shoeless Joe Jackson show up in a cornfield in Iowa! 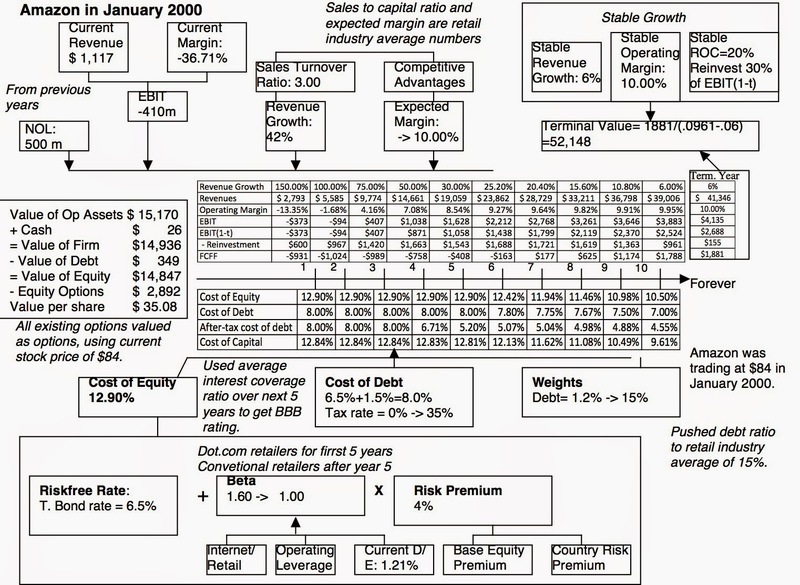 I am a Professor of Finance at the Stern School of Business at NYU. I teach classes in corporate finance and valuation, primarily to MBAs, but generally to anyone who will listen. Lyft Off? The First Ride Sharing IPO! The Perils of Investing Idol Worship: The Kraft Heinz Lessons! Is there a signal in the noise? Yield Curves, Economic Growth and Stock Prices! January 2019 Data Update 1: A reminder that equities are risky, in case you forgot! Back to Class: A Teaching Manifesto! The Bitcoin Boom: Asset, Currency, Commodity or Collectible?